Sew it yourself! 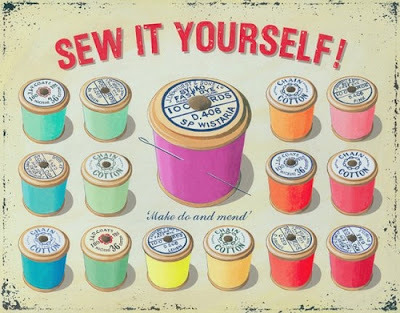 The Linden Life: Sew it yourself! I like sewing...in theory. I have been trying to spruce up an old rocking chair, and I wanted to redo the two little cushions on it. I dragged up my old sewing machine, which is actually just on loan to me from my mom, and tried to get started. Once I got everything threaded and cut and pinned and all that, I started to sew and did well for about 30 seconds. Then, the thread ran out. After a good 20 minutes (I am NOT an experienced sewer) I was ready to go again - fully threaded. But of course the needle jammed, then jammed again, and again... and I felt the need to take a break. While on my break I proceeded to eat half a bag of Ariba chips and half a bag of fruit gummies. Yuck. With a sugar-full belly, I tried my luck again. Things went quite well until I realized that I had cut the pieces way too small. Pillow cover #1 in the garbage, or actually to the Littlest Linden's toy pile. After a couple hours I decided to start again, only to sew the cover and realize I had not turned the fabric inside out. What was I thinking?? Who wants an inside-out pillow cover? Cover #2 got tossed into the toy pile. After struggling through pillow case #3, I am stumped. I don't know how I am going to sew the cover closed. I have made pillow covers in the past where you slip the pillow inside, without having to do a final sew shut. These won't work like this, because of how thin the cushion is. Sigh.